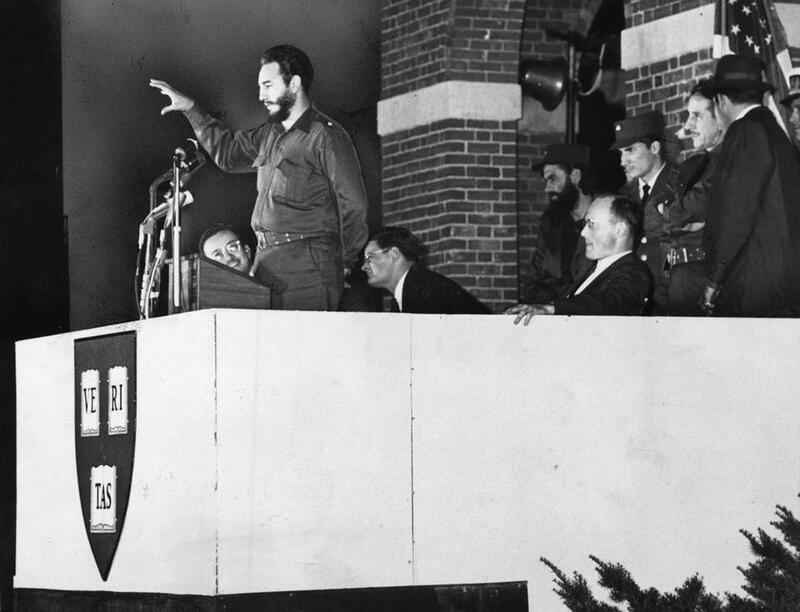 Fidel Castro spoke for 1½ hours at Harvard in April 1959. Castro’s visit aroused so much excitement that Harvard had no auditorium large enough to host his speech. So the Harvard football stadium was converted into an amphitheater. Castro was introduced by the chief academic officer at the University, Dean McGeorge Bundy, who began by apologizing for rejecting Castro’s Harvard application 11 years earlier. (Consider how a different decision by the admissions office could have impacted history.) Castro’s 90-minute speech, delivered in broken English, ranged from celebration of his revolution to a fiery critique of imperialism. It was “very, very long, challenging the most mind-numbing of professors for inducing restlessness,” one student told The Harvard Crimson. Even so, The Boston Globe reported, his comments met with “thunderous” applause. We look back today with ironic amusement at Castro’s Beatles-like reception here. But the fanfare raises a deeper question about US foreign policy: Would Cuba have clung so tenaciously to dictatorial communism had Washington sought to engage — instead of isolate — Castro and the Cuban people? Though counterfactuals have obvious limits, the record is instructive. In January 1961, John F. Kennedy, a Harvard graduate, took office. His presidential campaign had taken an aggressive anti-Castro posture. He named McGeorge Bundy his national security adviser. After the failure of a CIA-sponsored invasion of Cuba at the Bay of Pigs that April, Attorney General Robert F. Kennedy, another Harvard graduate, helped create a covert CIA program known as Operation Mongoose, dedicated to Castro’s overthrow. In 1962, the US also imposed a full economic embargo on Cuba. The embargo, which barred trade and travel to Cuba, has become one of Kennedy’s longest-lasting policy legacies. President after president has since declared that Castro’s communist outpost would soon fold to US pressure and be relegated to the “dust bin of history.” Yet nine presidents later, with the march of global communism a distant memory, Castro hangs on to life and his brother rules in Havana. The social sciences rarely allow for controlled experiments, where we can test initiatives for cause and effect. But occasionally the world around us offers its own clues. Is it accidental that the two states that have persisted the longest as bastions of Stalinist authoritarianism are the two that the US has most harshly isolated and sanctioned: North Korea and Cuba? Successful Cold War strategies suggest a better policy: one that combines containment of further expansion, on the one hand, with engagement that targets the hearts and minds of adversaries on the other. West Germany took the lead in a policy it labeled “ostpolitik,” which reached out to people on the other side of the Berlin Wall, made them aware of life in market economies and free societies, and thus undermined communism from within. It is noteworthy that another Harvard graduate — Barack Obama, Law School, 1991 — is now moving to relieve sanctions and recognize Cuba diplomatically. Assuming this process goes forward, if history is our guide, Raul Castro may end up being the last leader of a Communist Cuba. And Harvard-educated presidents will have taken the lead not just at the creation, but also at the conclusion of this strange chapter in American history. • Greg Watson: Is Cuba the future of farming? Correction: An earlier version of this op-ed misstated the month in 1961 when President John F. Kennedy took office.